If you had told me five years ago I would have more fun on top of a wet and foggy mountain than playing in Manhattan I would have said you were nuts. While I realize I am still on a steep learning curve moving from city girl to country gal, I am blown away by how unexpected gifts just fall from the sky....literally. Late yesterday morning I was pushing the wheelbarrow towards the corner of our property where we dump our non-compost organic piles. It was full of prickly rose bushes clipped for the winter and branches of withered blooms from butterfly bushes that were never deadheaded after their prime. As I approached the opening in the woods where I intended to deposit my cuttings I lost my balance and almost fell down. 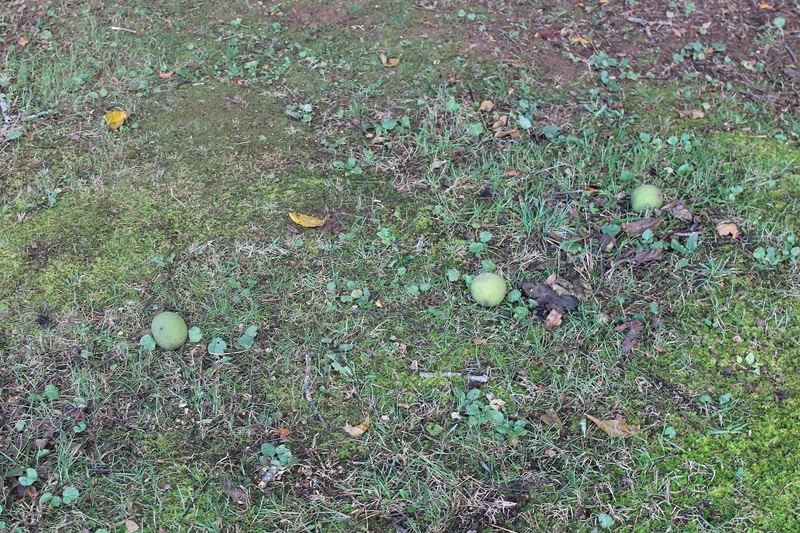 When I looked to see what I had stepped on it appeared the grass was covered with tennis balls. Now we’ve been up here on the mountain for about 16 months and I know better then to become excited about unidentified objects because I am usually disappointed. The wild rose bushes I found everywhere ended up being an invasive species that have caused me enough scratches and punctured fingers to boost the band-aid market considerably. The nuts I found on the ground throughout the woods were pig nuts, a type of hickory that are not appetizing. So today I knew better then to get worked up over unexpected tennis balls strewn about. I was able to smash one open and found it quite goopy with something that resembled a small peach pit inside. I brought it with a few other unharmed tennis balls to the front porch to identify via Google and promptly forgot all about them. Late this afternoon, after I had grabbed a bite to eat and collapsed into my office chair, I finally thought to ask Google......and Oh My Goodness......to my great surprise I found they are black walnuts! You may be familiar with the more common English Walnut, often sold in grocery stores in the shell or in pieces for baking. 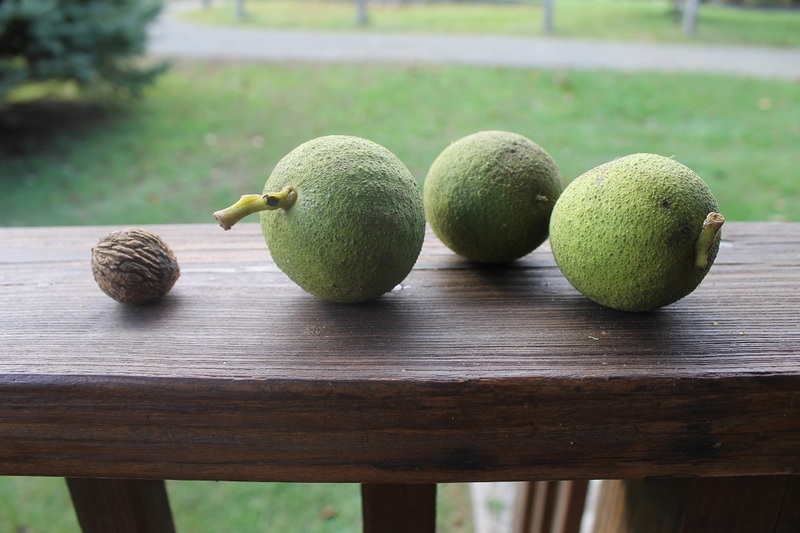 Black Walnuts are different. A cousin of the walnut, they have a much stronger flavor and people seem to either love them or hate them. I am familiar with them only from books and the internet because their medicinal healing powers are off the charts. Scanning a few webpages I quickly learned black walnuts should be promptly gathered when they fall from the trees before the squirrels can get to them. Also the tennis ball covering contains a sticky dark substance which is a powerful herbicide, killing many plants that would otherwise rob the tree of its nutrients. The black pulp surrounding the walnut shell inside its hull stains clothes and hands alike so thoroughly it was once used as a hair dye. Bouncing with happiness at my discovery I barged into the garage/workshop where Cog was working. Patiently listening to my nut babbling, he interrupted his task and followed me with my five gallon bucket to the scene of the gathering as we began to collect tennis balls. I was thrilled to fill the bucket ¾ full with our new free medicinal green balls of protein. There were some left at the very top of the 70 ft. tree, but most had fallen to the ground during the recent storms. Neither of us had noticed any other area on the property strewn with tennis balls, but when we were finished I grabbed an empty bucket and walked across the road to check. I would hate to let something so yummy go to the squirrels if there were more just laying about. And sure enough there were many more. I needed a bigger bucket. Not only did it seem like there were ten times more on the ground at this new location, but they were hidden here and there among the colorful fallen leaves, making nut gathering into something like an Easter egg hunt. After I had filled my buckets and gone back home twice to empty them Cog again quietly materialized to help. He deadpanned that I was having way too much fun. With the buckets once again emptied, and with Cog returned to his project, I set out alone to walk down the road a bit just to make sure we didn’t have another unnoticed tree. I stayed near the road and kept my eyes peeled. I discovered a few apple trees I hadn’t noticed before, but no nuts. And then there it was. A single tree, at least 110 feet tall, with all of its tennis balls on the ground. I quickly texted Cog that I had indeed hit the mother load. Within five minutes he appeared with the tractor towing the swivel dump cart behind it. I then texted the child unit to get into old clothes and hustle down the road to help out the old folks. “You’re doing what?” she asked, noting this was an unscheduled activity. As the light began to fade we filled the cart nearly to the top. I was almost giddy with excitement over my windfall. “You’re having way too much fun,” Cog reminded me. For those of you unfamiliar with black walnut trees, they grow mostly in the Eastern US and are not prolific because the wood itself is quite desirable. 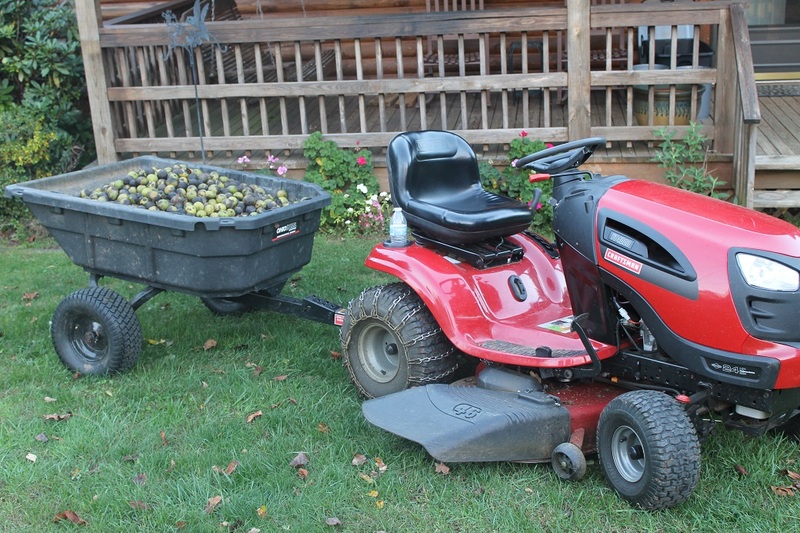 Also the walnuts are an extremely difficult nut to harvest. First the nut must be removed from the staining, goopy hull they grow in. The easiest way to accomplish this is to run over them with a car, truck or tractor to separate the soft hulls from the shelled nut. This is practical because the shell of the walnut is hard enough to withstand the pressure and isn't damaged in the process. After washing the walnut shells and letting them dry for 2-4 weeks, one needs a vise or a hammer to open each one. Then the meat of the nut is difficult to pry out as the inside has more nodes and walls than the regular English walnut. We have ’em too – lots of ’em. Black walnuts may be indigenous to the eastern coastal US, but someone forgot to tell those who brought them out here to Cali – they grow jes’ FINE all over our area. 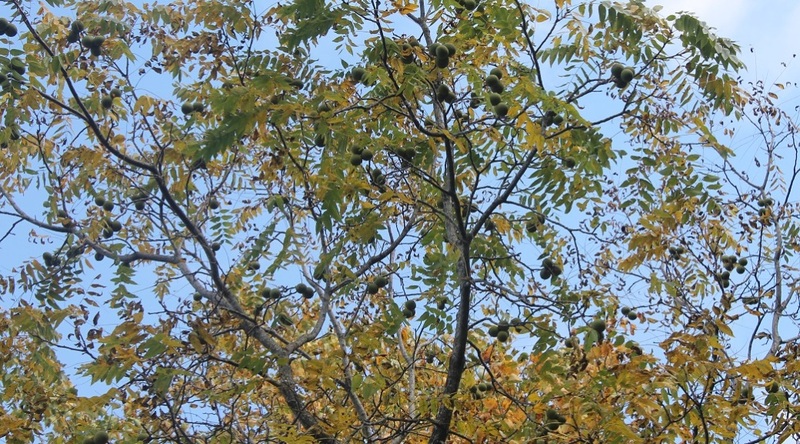 The ranch contains more black walnut trees than we can shake a stick at – so many that we simply let the squirrels have at ’em once we’ve gotten what we want. Messy? Yep. Very. Burlap bags-full, rolled over by a heavy truck or tractor several times, do fine for eliminating the messier parts of the process – but do wear latex gloves for handling or you’ll have brown hands for weeks. Then one needs drying trays (door-sized slatted flats with a 1″ x 2″ edge all around, supported by sawhorses) to let them air-dry in the sun for a couple of weeks to dry out the stain (which truly is a useful natural dye material). We do the same for our English walnuts, btw. Then they are ready to crack, collect, and store. I keep bags and bags of walnut meats in the freezer for winter baking/cooking, but the whole nuts also keep just fine in a barrel or a burlap bag stored in the cellar or out in the cold of the garage. Nature’s storage containers: shells! :) And, the discarded shells themselves make terrific mulch/pathway filler – but don’t get the shells near the veggie garden – the oil from black walnuts will kill roots and yes – it IS a great herbicide, but must be used judiciously. Root veggies are particularly susceptible. Have fun with your new stash – isn’t Nature grand?